Since day 1 with my unlocked HTC One, I have experienced issues with the lock screen of the device, and for the life of me could not figure out the problem. Well, until today, thanks to the Play store release of Floating Notifications. 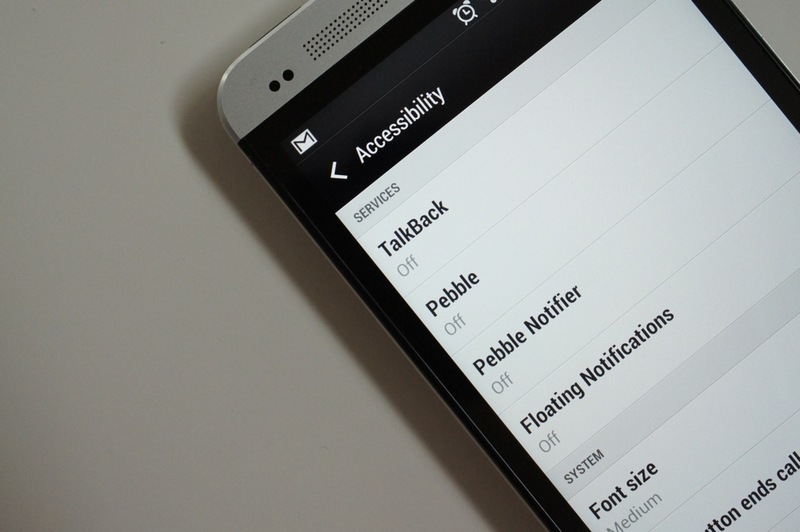 During the initial launch tutorial for the app, the developer made reference to an HTC Sense 5 bug that was breaking the lock screen if a user enabled any of the services under the Accessibility setting. As someone who uses a Pebble, and it’s pairing app that requires an Accessibility service to be turned on, this was the exact root to my problems. The video below demonstrates the issue, but I’ll explain it anyway. You see, the traditional Sense 5 lock screen requires a swipe up anywhere on the screen or the dragging and dropping of your dock app shortcuts in order to unlock. With an Accessibility service turned on, the entire thing breaks. With a service turned on, all you need to do is touch your screen with a single finger and the device becomes unlocked. No swiping needed. Where my blood boiled, was when the device would automatically answer incoming calls should I receive one and pull the phone out of my pocket. On almost every occasion, the phone would answer calls before I could even flip it over to see who was trying to reach me. Also, even if the phone was lying on my desk, the broken lock screen would make it almost impossible to decline a call. This issue affects anyone who wants to pair their Pebble to their One, or who use apps like Floating Notifications that requires an Accessibility service to be turned on. It’s a pretty significant bug, to say the least, and one that I’m surprised HTC has ignored for this long. Then again, maybe they were unaware of the fix for all this time, just like I was. I should point out that WidgetLocker can be installed to fix the device from unlocking with a single tap, though the dialer will bypass third party lock screens when receiving calls, so it won’t fix that problem. You can try using Pattern or PIN options through Sense 5, but that adds another step to accessing shortcuts and such (sort of defeats the purpose). It also doesn’t fix the incoming call bug. We were able to replicate the issue on a Sprint HTC One as well, so it’s not just the unlocked version. We weren’t able to test it on an AT&T version, though I wouldn’t be surprised if the issue was there.